Bark secured restoration funding to remove portions of old logging roads that are ruining key salmon habitat in Mt. Hood National Forest. Bark was awarded a grant from the PGE Clackamas River Hydroelectric Mitigation Fund and worked with the Forest Service to decommission 1.3 miles of road, improving water quality and critical habitat for native spring Chinook and coho salmon, steelhead and cutthroat trout, and recently reintroduced bull trout. Just last month a local contractor from Estacada completed the project and now Bark volunteers are getting ready to plant more than 600 trees to help the forest recover. Tree planting will improve water quality by shading the creek, stabilizing the stream bank and reducing soil erosion. This project will have positive impacts for years to come, but there is so much more to be done! Mt. Hood National Forest has more than 3,000 miles of roads, and out of these, the Forest Service identified only 153 miles that are “not likely needed for future use.” Bark recommends that the Forest Service go further and improve road density standards to no more than 1.5 miles per square mile, then take prompt action to reduce mileage accordingly. 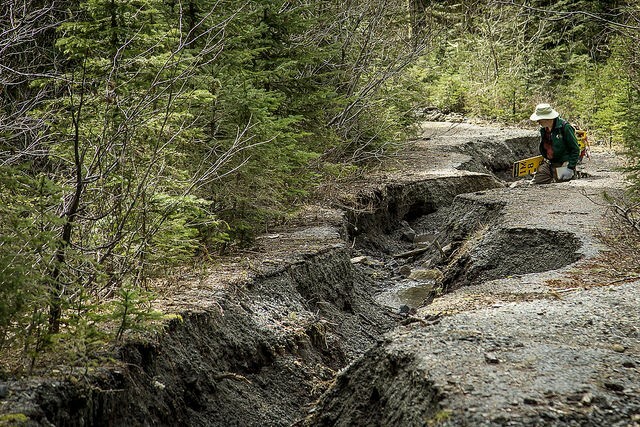 There are hundreds of miles of roads that can be removed, without interfering with the public’s access to trailheads. To show you what this looks like, our Forest Watch Coordinator created a set of maps to show where these roads are with recommendations for roads to be removed or converted to trails. Here is an example of roads in the White River Watershed.